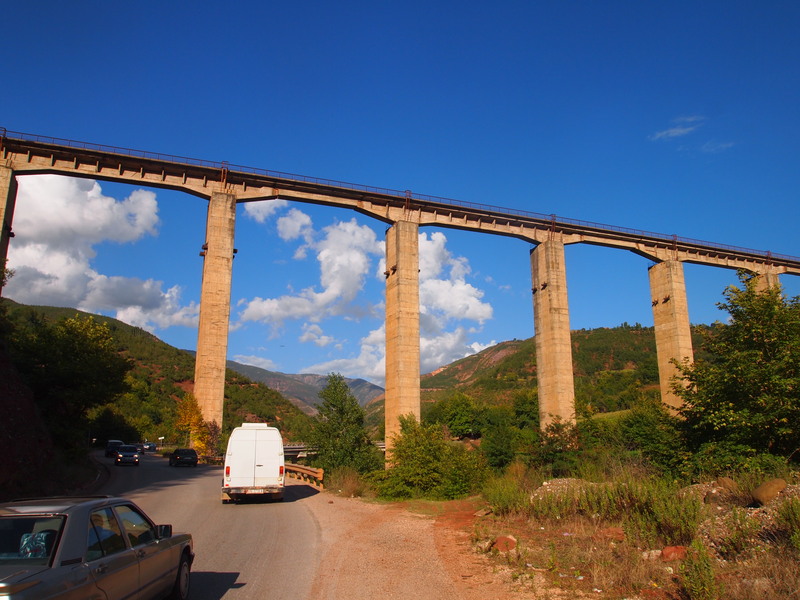 Will and I arrived at the Montenegrin/ Albanian border and waited our turn to pass through. As we approached the head of the queue a border guard came over and took our passports to get them stamped, or so we thought. This wasn’t the case, as when he returned them there were no new stamps in there, not for entering Albania or leaving Montenegro! It took me about five minutes to work out I’d even crossed the border as I thought I’d only left Montenegro not realising I’d passed into Albania at the same time. Still I imagine I’ll be missing these slipshod Balkan borders by the time I reach Iran. Riding into Albania it became apparent we were in a new country very quickly, it was far more obvious than at any other crossing. For one thing the road was worse, for another there were car washes (lavazh) dotted regularly along the road. This was a theme everywhere I would ride; they were everywhere. Some nothing more than a piece of gravel with a hose, others modern automatic affairs. Cars must get dirty quickly in Albania. 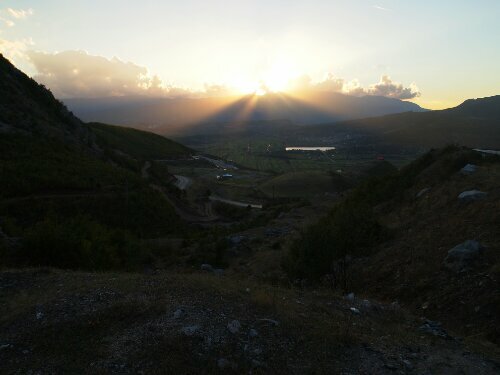 The nearest large town to the border was Shkodra and we decided to find a place to stay for the night there. During the evening there were a couple of power cuts which we were told was normal. The next day we headed towards Tirana where I was to meet my cousin Tessa who was on holiday with her husband visiting his family. Initially we were pleasantly surprised by the road, it was smooth and new and I made some of the best time of the trip. 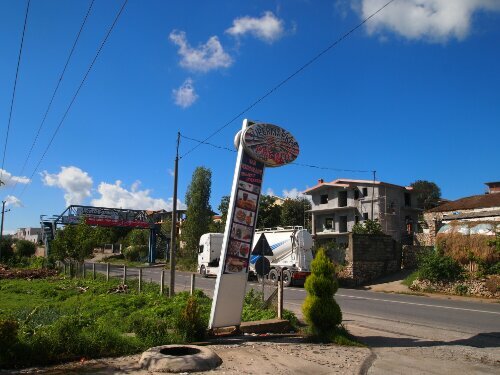 Some of the driving was quite scary as people whipped past at inopportune moments, indeed Albania is the only country so far where I’ve been afraid of being hit by oncoming traffic as well as cars going the same way. 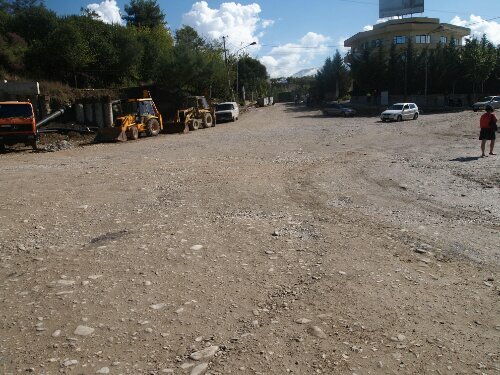 Then we reached the town of Lezhe where we’d have to leave the main road as apparently it became a highway. 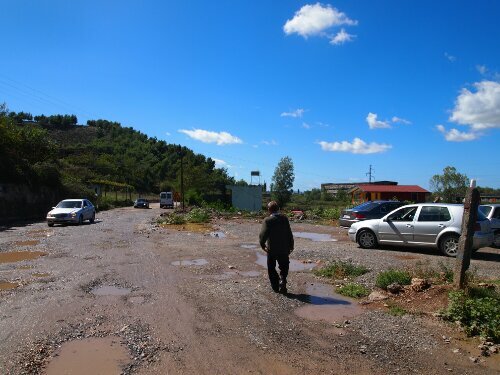 This was a shame as we soon learned that in Albania you want to avoid side roads. Often road is a term that only loosely applies to there routes that become tracks on occasion. After a lot of bouncing and jarring we made it back onto a real road and our progress improved. Until we took another side road, this one even worse than the last. We got back on the main road as soon as we could after that and stuck to it. 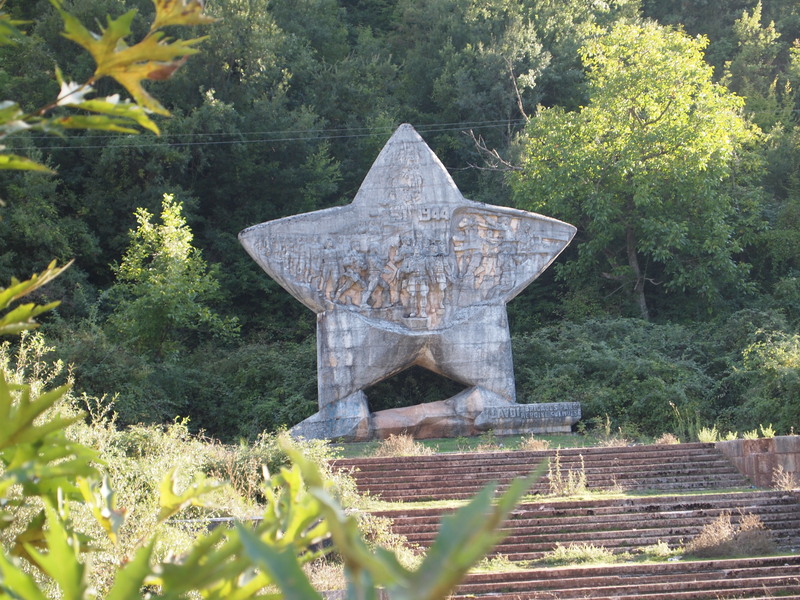 This was fine until we got about ten kilometres from Tirana. Suddenly the traffic intensified and the road seemed to worsen slightly. Cars were zooming along quite close pulling out without checking mirrors and turning across us without a care. We tried the pavement but that held its own dangers: open manhole covers with unknown drops, potholes and impassable parts. So back to the road and a quite stressful end to the journey. 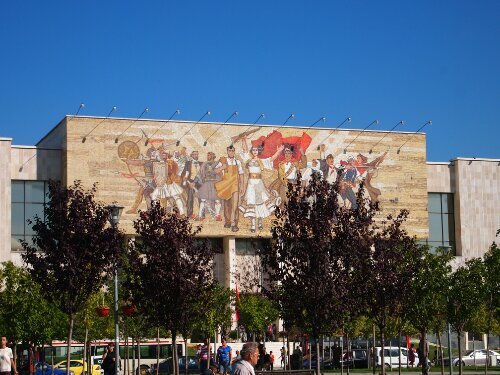 When we finally reached Tirana I bid farewell to Will who was going to find a hotel sharpish while I went to rendezvous point my cousin had texted me. Luckily one of the main road the traffic eased off and I found my way without too much trouble. Tessa and her husband Eddie then came and collected me and we headed back to Eddie’s parents’ house where I was treated to a lovely Albanian meal and some amazing hospitality. That evening I was also to experience Albanian driving from inside the car and it quickly became clear that Eddie was a scary driver even for Albanians. That said after a couple of days of being Eddie’s passenger I wasn’t so nervous about the rest of Tirana’s traffic. After a day off the bike which included a visit to the beach at Durres I was ready to set off again. I’d been well looked after by Eddie and his family and was ready to continue. 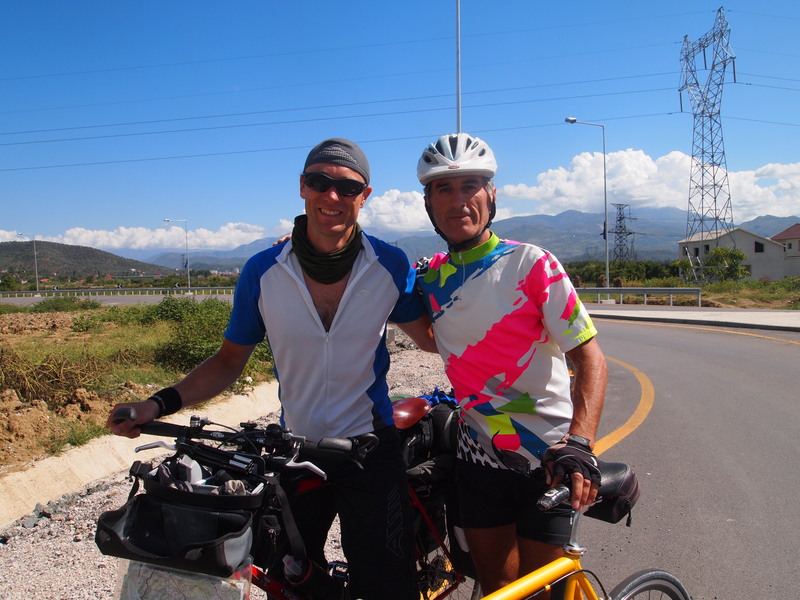 Eddie’s brother in law: Astrid lead me back to the road where I’d been collected from when I arrived in Tirana and I was good to go. I rode right through the centre feeling a lot more confident about the traffic now. People were very friendly throughout and I got more nods, waves and hellos than any other country by a mile. Then I came to a fork in the road, ahead I could see the gaping maw of what was clearly a very long tunnel right through a mountain. It had two mouths and there were lights above indicating which lane to enter. I’d got off my bike and was about to use my phone GPS to see if I had to go through it. I was pretty sure that this was the start of the new highway and I’d have to turn off and head up and over on a very tough climb. Then out of nowhere another cyclist appeared in full road racing kit with a nice if old bianchi bike. 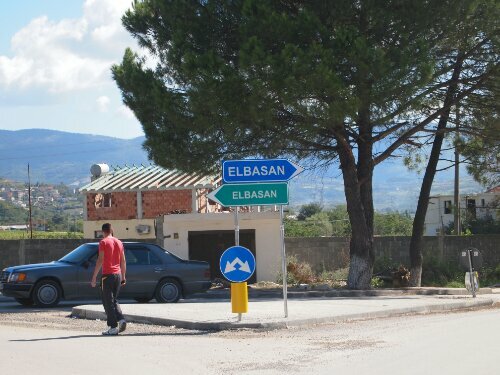 He starts talking in Albanian and I point towards the tunnel and ask ‘Elbasan?’. He nods says some more stuff and gestures to follow. I’m wondering if we are really going to go through this tunnel especially when I see the sign indicating it is about 2.5km long. I figure he must know what he is doing, he is a local after all. I really start to wonder when we head down one of the lanes with a big red cross over it… Had I unwittingly entered into a cyclist’s suicide pact with this stranger? But no, with some sign language I work out that cars going in the other direction use another tunnel, we are in the lane for emergency vehicles. We are thus able to fly through the tunnel with no problems, it wasn’t busy, was well lit and had ventilation so none of the problems I was expecting arose. Next thing I know we are through and Guzman, (sp?) I’d asked his name as we went, is gesturing me behind him. So I spent the next half an hour sitting in his slipstream as we whizzed along the highway at almost 30kph. It was like I’d met a cycling fairy godfather! I’d have been labouring up a mountain for ages if Guzman hadn’t arrived at that exact moment, as I’d decided to avoid highways as normally cyclists are forbidden on them. Clearly in Albania that rule isn’t enforced and I even felt safer on the motorway as the road was wider and not so busy. I continued on alone through some fascinating scenery. 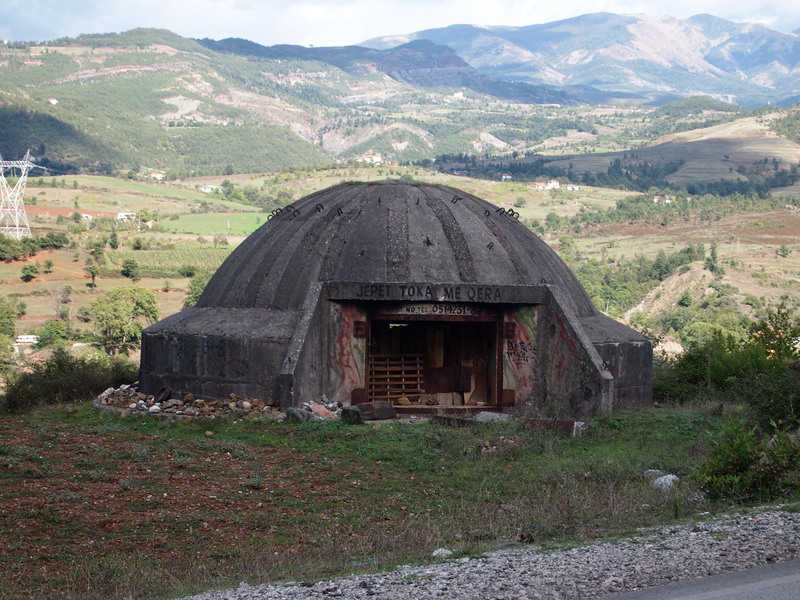 There are remnants of Albania’s complicated past everywhere. Including bunkers. 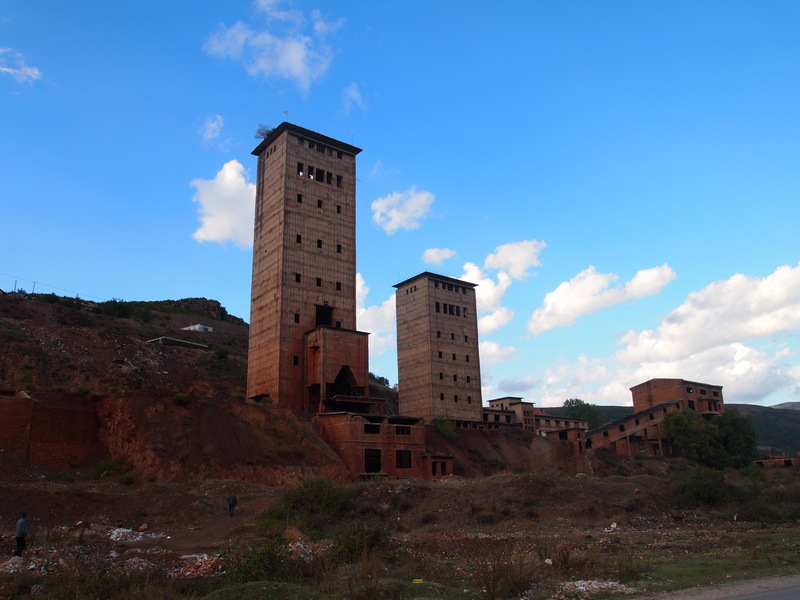 Of which there aren’t many left as they’ve been ripped apart for the steel. With Guzman’s help is made better time than expected and the Macedonian border seems within reach so I press on. Until I’m presented with a mountain. A mountain which I have to cross to get to the border. I still have some light so I decide to continue with my plan and I start labouring up the switchbacks. I’d already gradually climbed up to 600m that day and I had another steep 400m to do before I reached the border 1000m up and left Albania. I am reading your travel journal with great interest: I would like to have a similar adventure to write about, hopefully, in a few years, I’ll be able to. However, I have a question about how you’re able to write to your blog. Do you carry a computer or do you use Internet cafes or something else? I’ll continue reading tomorrow evening and look forward to catching up with your more recent days in the saddle. Hi Jules, after some experimentation my usual method of writing is now to use a small tablet with a rigid small wireless keyboard. I find this gives me the advantages of a tablet with those of a small netbook. To upload to the internet I use a SIM card with 3G for the country I’m in and use my mobile phone to create a mobile hotspot I can connect to with my tablet. Wi-Fi has been pretty readily available in most cities as well.